The book, Are You Ready to Succeed? 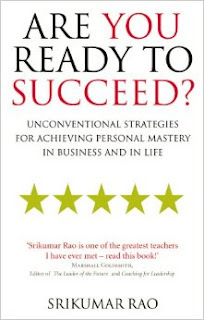 by Prof. Srikumar Rao was introduced during one of the personal development electives at IIM Bangalore. However I got the chance to read it completely only now. This is a light as well as a heavy read depending on what your intentions are. Professor has included lot of exercises;more like self reflections in each chapter. So if you are doing every exercise seriously, the book is a heavy one requiring your sincere efforts and time. I would consider the book to be a self mastery book focusing both on personal and professional lives. The author has taken lot of ideas, and examples from eastern philosophy. Two key ideas that I took from this book are mental models and mental chatters. Mental Models - Put it simply, its nothing but how you formulate realities. For example, your may have built a mental model that unless you are in the US, no one will consider you successful; so even if you are in a good job, happy life and have all the possession one can imagine, you will still consider yourselves a failure. What the author argues is that - this is just one of the realities that you have accepted; there could be other realities as well, for example being able to follow your passion also means being successful. Professor Rao urges the readers to try and find out alternate realities that helps to succeed instead of following a downward spiral path. Mental Chatters - Mental chatter is the continuous self talk that you may have. Its built and continued based on the mental model you have built. For example, let's continue the example of above mental model; your mental chatter may be - oh, Tom went to the US for his higher studies; he wasn't even close to my caliber at school; yet he has gone. I am un lucky; I am of no use...I wont succeed etc. Professor Rao argues that mental chatters are real and it strengthens the mental model you are following. The book revolves mainly around these two concepts and dives deep into how to build a better life, relationship in personal, professional and societal lives. Few of Professor Rao's lectures are available in the net and these discusses about the ideas mentioned in his book. Overall a good book and powerful concepts!